Are you getting married in 2014? Then this gift may be very useful to you. I’m sure you are going to love it even if you aren’t planning a wedding soon. 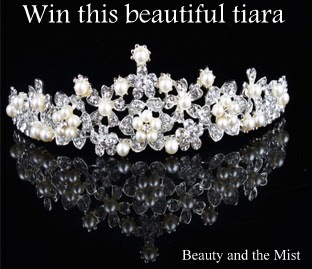 MyeSoul.com is offering this beautiful tiara for a lucky winner. The site is a little heaven for women. They sell everything a bride needs from wedding dresses to bridal shoes and accessories. There is also a large variety of occasion dresses. The gift they are offering is a tiara with handmade pearls. The company is going to send it straight to the winner and I’m not responsible if it gets lost or damaged during delivery. To enter the giveaway there are two things you need to do:1) be a member of the blog on the right where it says Join this site with Google Friend Connect (GFC followers). And write your name in the widget below. Nevertheless, after that you can follow more steps and earn more entries. Good luck! 20 valid entries are needed for the giveaway. The giveaway ends on 15th January. Don’t forget the Necklace Giveaway here.